In the distance and on the left of the picture, you can just see a bit of the low railway bridge that runs over Stroud Green Road - beyond the bridge is the left hand turn to Well's terrace. To the near left and beyond the roadwork barrier is the tube station entrance and what is now a bus terminus and pickup point for routes 4, 19 and 106. The Majestic Ballroom has long gone, but I wonder if anyone remembers it? 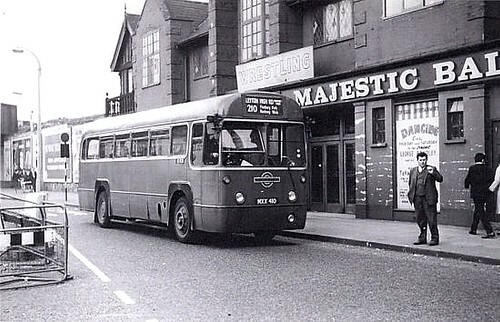 Originally the stabling area for horses in the tram depot, it became the Finsbury Park Cinema, then the Rink Cinema, then the Gaumont Cinema and closed in 1958, only to reopen in 1959 as the Majestic. Although it has lost the Seven Sisters Road entrance and foyer, the building still stands and is now Rowan's Bowling Alley. The next picture but one in this set shows the auditorium when the building was a cinema.